The cold is starting to settle in. 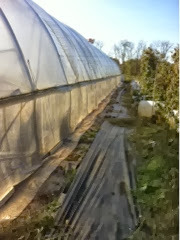 Nighttime is almost always freezing, so it is time to reattach the sides of the hoophouse. If we were smart, we would have roll up sides on the thing. While in summer the sides stay up and in winter the sides are always down, there are transition times in spring and fall where having the sides different from day to day would be helpful. When the bitter cold temperatures arrive just a week after tee shirt weather...we are never quite prepared. It takes all day to get the sides on, and a roll up crank would be so much easier. 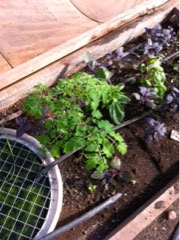 In the mini dome there are still summertime herbs growing. And a couple of tomato plants too. 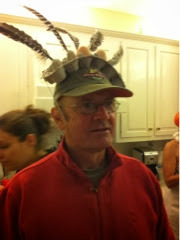 Last night we attended a haloween party. We went as a couple of good eggs.